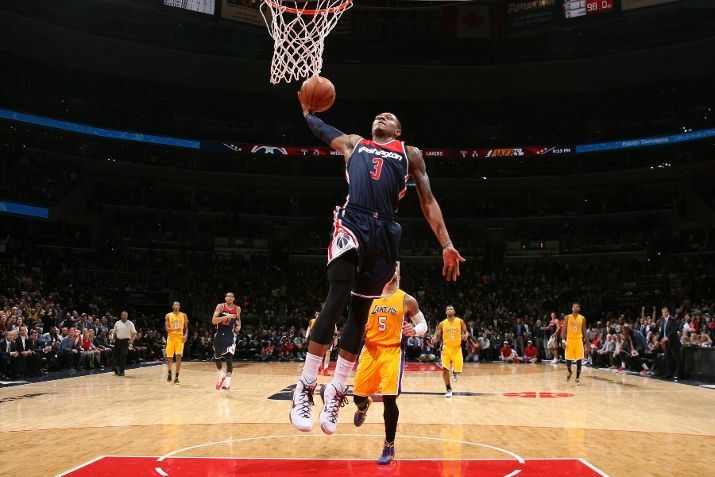 Bradley Beal led the way for the Wizards with a season high 27 points and 7 rebounds as the Wizards beat the Lakers 111-95. John Wall had another terrific night with 17 points and 15 rebounds. Also, Kris Humphries added 6 points and 20 rebounds. No, that’s not a typo. The Wiz came out in their alternative jerseys for this marquee game against the Lakeshow… I mean the Lakers. The lead seesawed back and forth before Kobe finally demanded the ball. The Wizards started out with Beal guarding him and Kobe liked that matchup. Kobe went straight to the block and knocked in several fadeaway jumpers over Beal. Kobe also used his crafty veteran moves to get to the line early and often ending the quarter with 15 points. Nick “Swaggy P” Young wanted some revenge on his former team. Swaggy P hit his first three three pointers off the bench and looked to scream at the crowd every time he knocked down a shot. The Lakers ballooned the lead to 10 in the second quarter with 7:10 remaining and this had the makings of a #sowizards game. You know… getting all hyped up and coming out flat? Sure enough, Paul Pierce continued to attack the basket and get to the line even though his jump shots were not falling tonight. Per usual, Rasuel Butler came off the bench and was an instant spark, he ended the game with 14 points on 5-7 shooting. The Wiz utilized a 11-0 run to capture the lead with 3:02 to play in the half when Marcin Gortat hit Bradley Beal cutting through lane for a monstrous dunk. The Wiz picked up where they left off in the second half. On the first possession, John Wall captured the rebound and sprinted coast to coast for the layup and the foul. The Wiz, especially John Wall looked to push the ball early and often as the team ended the game with 17 fast break points. A key moment in the game was when the Wizards switched Paul Pierce onto Kobe. Although Brad was doing a nice job, Kobe was just too good for him so Coach Wittman let Paul Pierce lock up Kobe and boy did he. Kobe did not have a made field goal in the second half. It looked like the Wizards might let this one slip away when early in the 4th, Nick young hit back to back three pointers and let the crowd know about it just in case they missed it. Once again, the teams traded buckets for a majority of the quarter until Bradley Beal hit a three from the side to stretch the lead to 7. From that point on, the flood gates were opened. The Lakeshow, sorry… Lakers forced up terrible shots and turned the ball over which led to 3 straight highlight reel dunks. With the lead comfortably in hand, John Wall was merely dribbling out the shot clock when he jacked up a 3, made it, and got fouled by Kobe for the cherry on top. Wiz look to continue their winning ways against the Nuggets Friday night.